In the week I realised how little I care about Back to the Future my film-cap as usual starts with a few plugs: I put up a review of Robert Zemeckis’ The Walk along with Cary Fukunaga’s Beasts of No Nation. Do check out what I thought about them. Fukunaga all but confirmed my assertions that Africa needed to take hold of its own story telling. He buggers his world building and depiction of the African country (Ghana). I did see this coming to be honest but that’s just by the by. 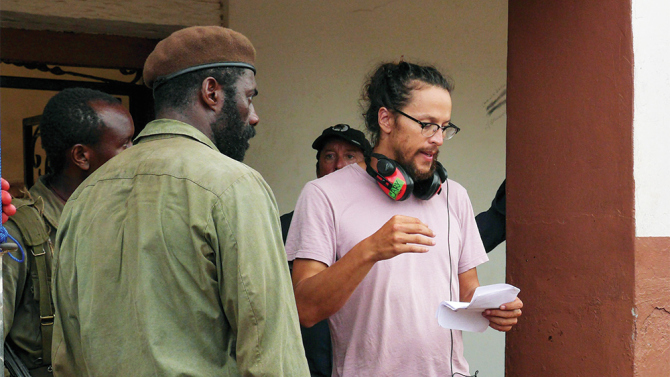 Following Beasts of No Nation I was thinking about how Fukunaga reminded me of Ridley Scott in that they both hold mastery over visuals but their films are ultimately as good as their scripts. Give Scott a good script you get a good film. Give him a great script and you get a great film. Give him a bad script and you get Kingdom of Heaven. Fukunaga has small back catalogue and any assertion may be premature but his stellar work in Jane Eyre and True Detective was penned by other individuals. I however haven’t seen Sin Nombre though but he seems to be towing the same line as Scott. Just a random thought we can look to explore as the years go by. This week I saw the teaser for Pascal Aka’s Interception as the film’s (yet unknown) release date draws closer. It is looking good to be honest and there is cause for optimism. Released with the backing of Nilani Media, Interception is an action film about a team of highly trained ex-special forces who have been handpicked by the Vice President of Ghana for special assignments. Yes I find that weird too – why the vice president? Aka’s film will be staring John Dumelo, Adjetey Anang, Chris Attoh, Ama K. Abrebese and Jasmine Baroudi among others. I don’t see any 8th wonder connections which lowers my confidence in this film as an action spectacle and I hold reasonable reservations about the physical capabilities of the core cast to perform in an action capacity but my fingers remain crossed. Now the film I really want to see Aka to make is The Banku Chronicles – Ghana’s very own Pulp Fiction. The trailer for the latest instalment of the Star Wars franchise was one of the biggest things to hit earth this week second only to Hurricane Patricia. There was the usual hype of course but this time there was some extra special garnishing of racism to go with the online mania. The trailer was released on Monday with a number of the cast featuring among them British actor John Boyega, who is black. He of course bore the brunt of the racist fuelled rhetoric. 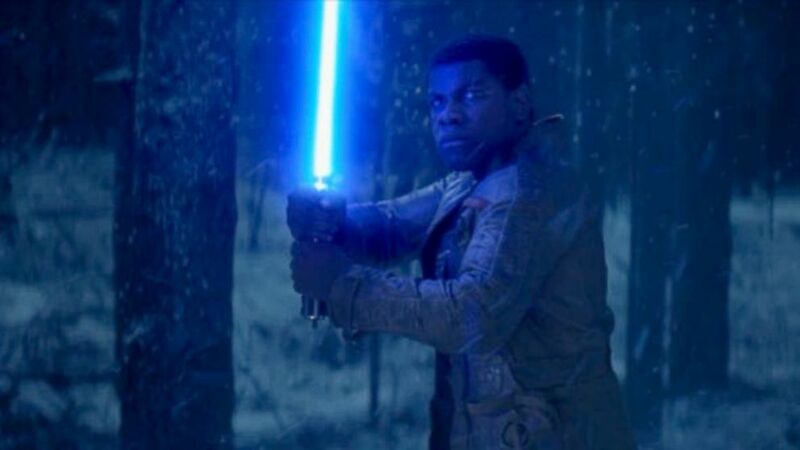 Now we all knew Boyega was going to feature prominently in this film going by the initial teasers. I guess we just didn’t know how prominently. Watching the trailer we are given a glimpse of shot that implies the film’s apex show down will be between the characters Boyega and Adam Driver play. In simple GH parlance Boyega is the “blowman” and Driver the “killer” (or Killer jack). On seeing this shot it hit me – Boyega was THE guy in this film. At the same time this very fact was dawning on a number of racists folk. Not only was a black guy wielding a sacred light saber (how dare he!) he was going to save the day. Billy Dee Williams never got to touch one and it was okay when Sam Jackson brandished a light saber because he lost his hands as punishment but the thought of this young BLACK guy being this generation’s Luke Skywalker is driving some racists mad – and I love it! A few dozen accounts started calling for a boycott of the movie using crass racial terms and throwing around allegations of “white genocide”. Some abuse was also targeted at the director JJ Abrams who is Jewish because why not. 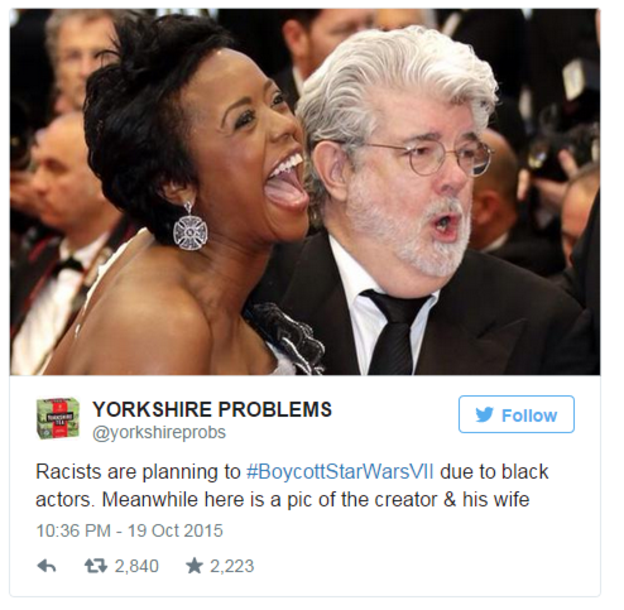 On Tuesday, #BoycottStarWarsVII soon started trending around the world but common sense prevailed with a lot more people condemning racism jumping on the hashtag. Now I have the perfect reason to go see the star wars film seeing as every dollar this film will make will get under skin of some racist folk. To round off this post we head on to one of our competing neo colonisers – China. 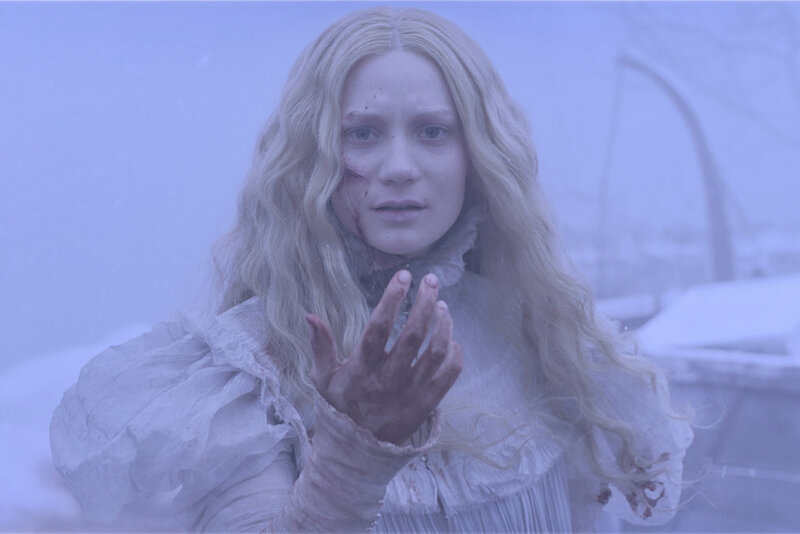 Guillermo Del Toro’s gothic romance horror Crimson Peak will not be given screen time in China because of Ghosts. The supernatural elements in Del Toro’s new film have robbed it of a significant audience in China because China’s Film Bureau doesn’t allow movies with supernatural elements to screen within their borders as they are seen to “promote cults or superstition” which is contradictory to the “Communist Party’s secular principles.” Party poopers. The article I read pointed out that the Ghost Busters reboot hits theatres next year and although this may be a disingenuous comparison but the Ghost in Ghost Busters will be real too but I doubt the big cinema chains in China will allow Slimer to float past their cash registers. Crimson Peak was never going to make droves of money. Only cinephiles will be going to see that one so it’s the perfect scape goat. What I would give to see Crimson Peak on the big screen her in Ghana and China are just chucking away the opportunity. SMH. Have a nice weekend y’all. My film of this week was Robert Zemeckis’ moving ode to the Twin Towers in The Walk and remember, it must be seen on the big screen.